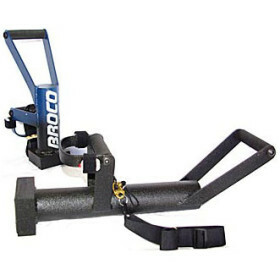 Broco® ENFORCER™ Door Ram » Protective Solutions, Inc.
Broco® series one-man door rams are engineered for rapid forced entry by tactical teams and first responders. The ENFORCER™ breaches most residential doors within one to two seconds, and forces open doors with as many as seven different bolts, locking systems, and chains. Full-sized ram is 24" in length and weighs 38 lbs, shown in front of image; Baby ram is 16" in length and weighs 25 lbs, shown in back of image.